No matter how much you try to get your beauty sleep or stick to a nutritious and well-balanced diet, you still have to face the horror of dark circles under the eyes at one point or the other! For the lucky few, it can be just a temporary thing but most of us seem to be fighting dark circles under the eyes almost every other day. This is because red, blue and purple below the eyes do not stem exclusively from lack of sleep or a deficient diet! 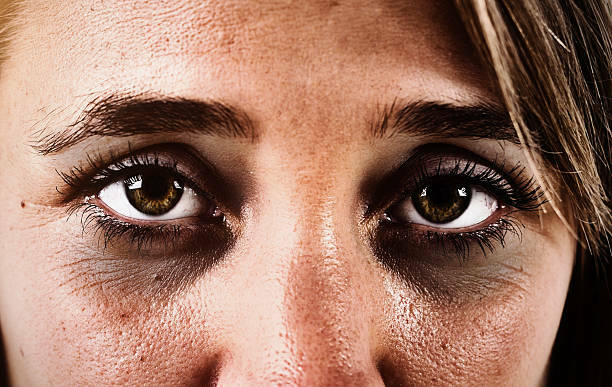 Dark circles can be traced back to your genes. For many people, it is a hereditary condition which runs in the family. Those who suffer from eczema, tend to constantly rub the eye area owing to continual itching there. This leads to the area becoming swollen, inflamed and with broken blood vessels, lending it a dark and almost bruised appearance. Allergies are another common cause. Since the eye area has the thinnest skin in the body, it responds to the histamines produced in the body in response to the allergy and you may experience irritation, rubbing and scratching. This can cause dark circles. Believe it or not but make-up is also one of the most common culprits causing dark circles. Even though it is supposed to camouflage dark eye circles, its chemicals may trigger allergy and cause dark circles. Sometimes, it is your bone structure that naturally causes dark circles. If you have deep tear troughs below your eyes, the indentation and shadowing would naturally ooze a darkened vibe. Fillers from a certified pro would be the best solution here. Too much exposure to harsh rays can also cause dark circles. The thin skin around the eyes is first to burn and get dark. Insomnia and lack of sleep are one of the prime reasons for having dark circles around eyes. 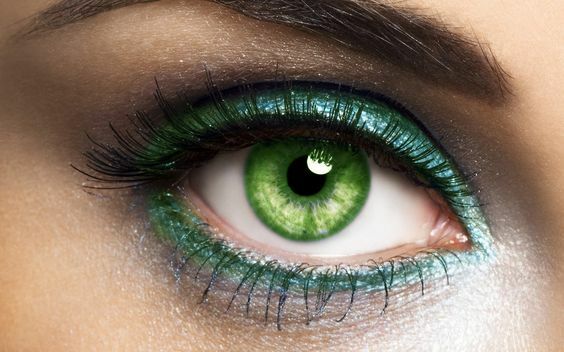 If you are getting worried about dark eyes because of its various causes, rest assured! 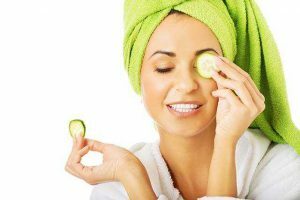 Even though there is no one-solution fit all for dark eyes, you can follow some basic tips to get rid of dark circles naturally and then opt for some specialized treatments to treat dark circles based on certain unique conditions. Below we would discuss each unique situation and their remedies. All these hold true for how to get rid of dark circles for men too! Solution to how to get rid of dark eyes is far easier than it looks! These can be lightened to a great degree with proper sleep, well-balanced diet, employing all home remedies etc. Adopting some natural ingredients and healthy habits can easily make your dark circles disappear like magic. Let us glimpse through some of the natural ways and ingredients to combat dark circles fast and even permanently. The area under the eye has the thinnest skin present in our entire body. It does not even have any oil glands. Thus it requires special care. Keeping it hydrated is essential. While you must drink oodles of water to keep them hydrated naturally, you can also apply under-eye gels and creams which help in the water retention in the area. This will also keep fine lines away and lend a healthy glow to your under eyes. Being delicate, the under-eye area requires special handling. Any unnecessary pressure or harsh treatment immediately manifests as darkening of the area. They should be gently cleaned with an extremely mild cleanser and makeup must always be removed gently with an eye-makeup remover. We fail to realize the importance of eating right! Iron and vitamin deficiency is your nutrition is one of the key factors causing dark circles. Insufficient amount of these elements leads to poor blood circulation. This, in turn, causes dark circles. Iron, Vitamin K, B- 12 group etc. are essential for proper blood circulation while Vitamin E, D and A are necessary to boost collagen production and keep away and darkening or area and fine lines. They say ‘eyes are the window to the soul’. Any kind of stress, anxiety will automatically manifest as dark circles under our eyes. Practicing meditation is a terrific way to de-stress yourself and reduce dark circles like magic! Try it for a week and its amazing effect will leave you hooked to it like a fish to water! With vanishing dark circles, your skin will feel so right and wonderful! One need not resort to costly chemicals or drastic measures to reduce the dark circle! Nature has bestowed us with some wonderful ingredients which are wonderful to treat dark circles effectively. 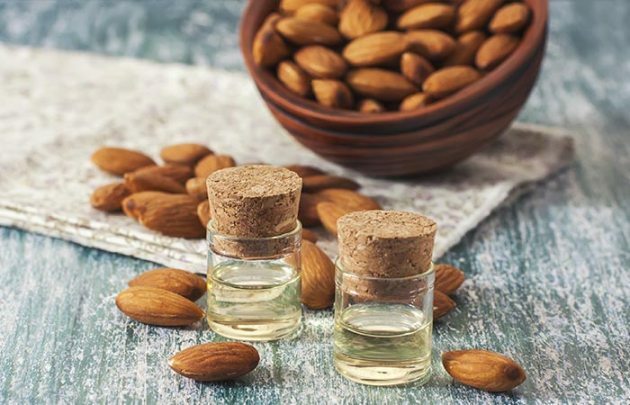 Almond Oil is considered to be one of the most beneficial natural ingredients which yield spectacular results in combating dark circles! Its Vitamin K, palmitic acid and retinol content are terrific moisturizers, skin lighteners, and skin softener. Enhance its benefit by mixing some Vitamin E oil to it. All you need to do is massage the eye area gently in a circular motion with a few drops of the mixed oil till it gets well absorbed. Leave overnight and wash it off with cold water in the morning. Bid goodbye to dark circles and fine lines in less than a month by doing it diligently, every night! Most of you have various essential oils closeted in your house today! Take them out and make them the best arsenal against dark circles! Chamomile oil can be used just like almond oil. Its anti-inflammatory ingredient works wonder for puffy and swollen eyes. A few drops of Eucalyptus oil mixed with a carrier oil like coconut oil works wonders. However, Eucalyptus oil is toxic. Hence just a drop or two should be mixed with coconut oil and gently massaged into the eye area. It must always be washed off well after about 15-20 minutes. Rose and Sandalwood Oil work best as steam. You can add a moderate amount of any to a pot of boiling water and cover your face with a towel while its steam hits your face and under eye area. Lavender Oil is another excellent essential oil. You can apply it directly or by mixing some carrier oil with it. Massage the area well and wash it off after 30 minutes with cold water. Next time you are brewing your black tea leaves or any of the herbal teas like the chamomile tea; refrigerate your tea bags instead of throwing them in the trash can! Place them over the eyes for about 10 minutes! They would eat away your dark circles so quickly that it would seem magical! Tomatoes are excellent for skin lightening of the under eye area. You can extract the juice of one medium-sized tomato and mix it well with the juice of a lemon. Use it as a toner to massage the area well and gently. Wash it off after 20 minutes! This is another terrific ingredient with excellent bleaching properties! Simply apply the potato juice or grated potatoes over the eye area and wash off after 10 minutes. Repeat it daily or alternately to feel a spectacular transformation of dark circles disappear! 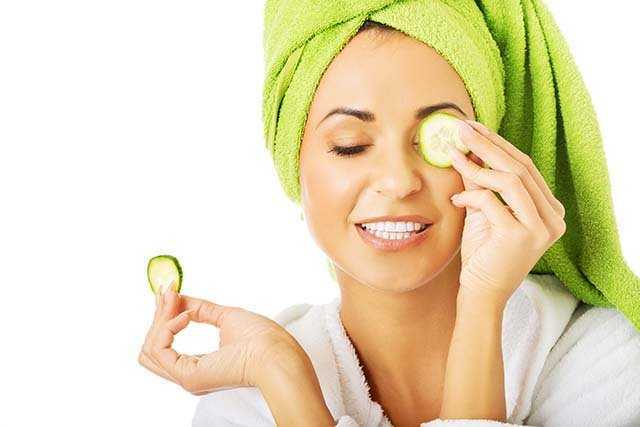 With its skin lightening and mildly astringent properties, nothing can beat the benefit of cucumber! Place its chilled slices or grated mix over eyes and wash off after 15 minutes. You can do this twice a day daily for a fortnight at least to get amazing fast results. As a rule, you avoid eye area while applying any of your DIY face packs. Pamper your eye area as well with special formulated eye-packs and masks which would eliminate under eye-circles and remove any puffiness. They would also reduce fine lines and wrinkles to firm and strengthen the delicate skin for a radiant and youthful vibe! There are some wonderful eye masks like that prepared from potato juice and milk powder; carrot and coconut milk eye mask; cucumber and aloe vera eye mask, green tea eye mask etc. Which would leave the eye-area wonderfully pampered and nourished! There are various specialized eye area exercises, facial exercise as well as some yoga asanas which are excellent to reduce dark circles. They do so by increasing the blood circulation and better elimination of toxins from the eye area! Yoga poses like Hastapadotasna, Viparitakarani, Sambhavi Mudra and Surya Namaskar are highly beneficial. Tapping the area around the eye gently with the fingertip of your index finger will stimulate blood circulation and enhance skin lightness. Close your eyes to relax a bit and open them. Now, place your fingers above the eyebrows and lifting them as much as possible. Hold it for about 10-15 seconds and relax. Repeat 10-15 times to combat dark circles. There are numerous other exercises available to make the path easy of getting rid of dark circles. Moisturize the eye area well with a good eye cream or gel before applying any makeup. You may have learned to use concealer before foundation but trying using them after foundation. 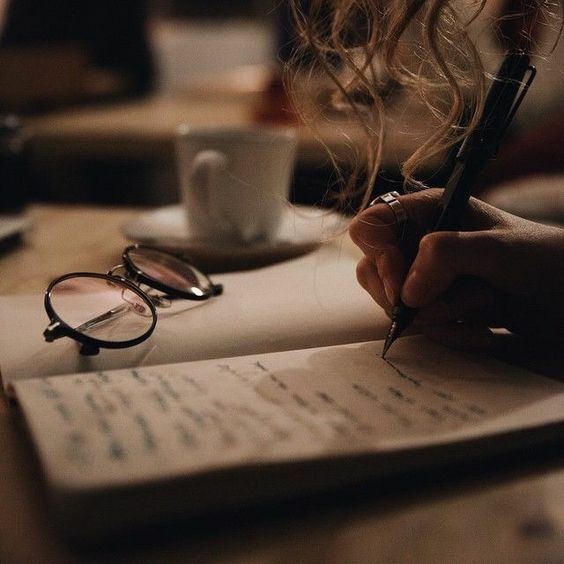 You will get better results. Choice of right concealer defines your success or failure. Always use one with undertones of opposite shades of discoloration. Opt for darker concealer to tackle puffiness while a lighter tone to hide deep lines. Generally, it is a tone or two lighter than your skin. 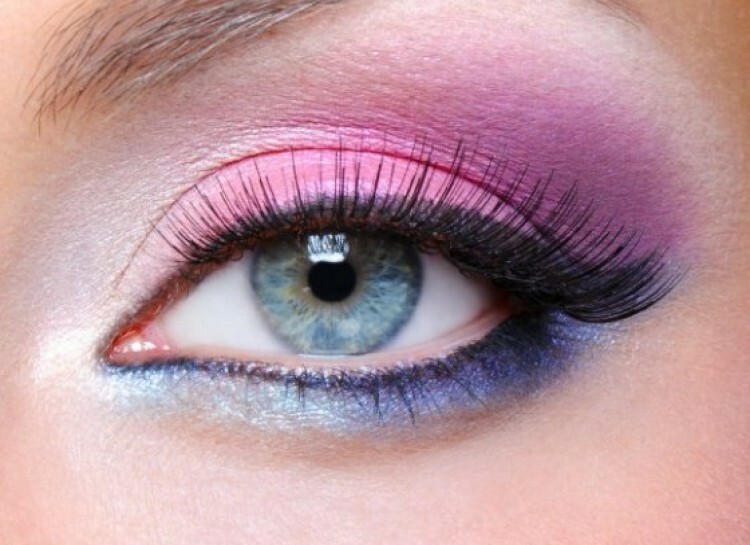 Blend it well without forgetting the inner corners of the eyes! Now apply other eye-makeup like eye-shadow, mascara etc. 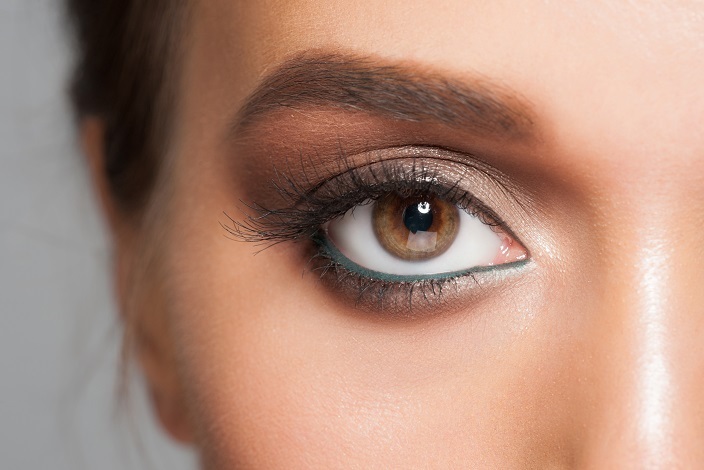 If you are looking for an instant remedy to hide dark circles then camouflaging using concealers and smart makeup also works to a great extent. Use of non-prescription-strength lighteners like hydroquinone acid and kojic acid are awesome in blocking the production of melanin and gradually lighten the area. A professional chemical peel is also wonderful to lighten the area considerably. However, if you are looking for how to remove dark circles permanently, you can opt for laser surfacing and other medical surgical procedures. Beware, these may have certain risks and should only be undertaken after deep thoughts. Going all out for a healthy lifestyle, nutritious diet, de-stressing, and proper eye-care routine, you can be confident of beating under-eye bags as well as dark circles! However, remember that regularity with good diet and discipline is the key to success! With these tips, make dark circles a history!